For anyone who has seen these iconic falls, but never been able to put a name to them, this is Multnomah, outside of Portland, Oregon. Nestled in the scenic Columbia River Gorge between Washington and Oregon. I had the pleasure of visiting this, and many other scenic waterfalls of the Gorge area earlier this year. Just a skip and a hop from the Okanagan I call home. This isn't just any vertical composition. It's actually a couple horizontal frames stitched together to make a vertical panorama. Quite the opposite of your typical horizontal panorama. I try to use a longer shutter speed when blending panoramas with moving objects in them. It should help reduce the apparent ghosting because it introduces its own natural in-camera ghosting, in this case, showing in the form of silky smooth water. 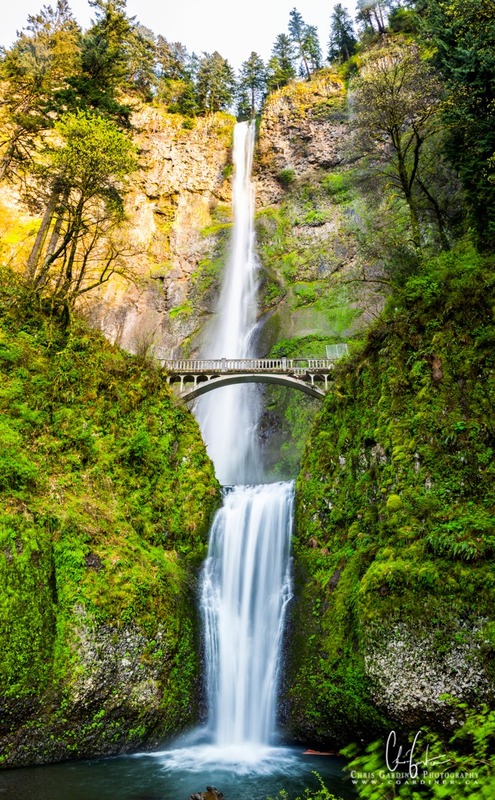 Would you like this beautiful scenic print of Multnomah Falls all to yourself on paper or canvas? You can do that, on demand, whenever you're ready at the size you want. Click here to take a look!